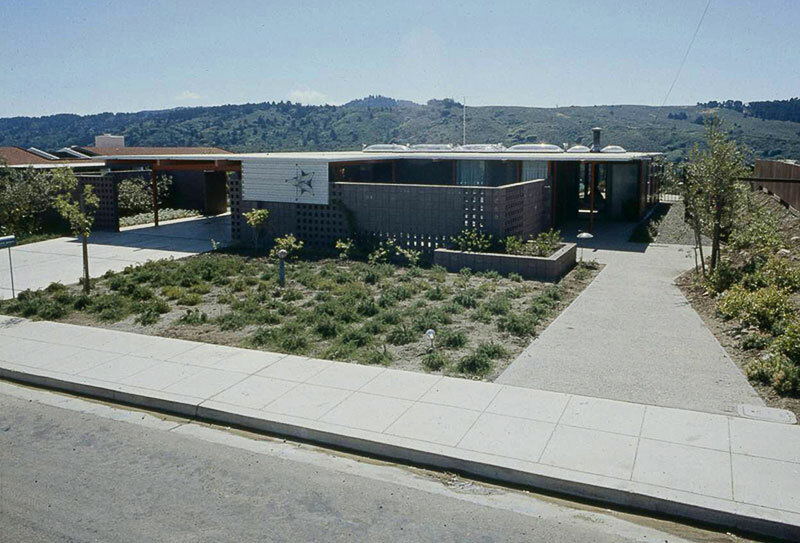 Joseph L. Eichler (1900–1974) was a renowned homebuilder, responsible for a number of keystone midcentury-modern developments, or tracts, across California’s Bay Area between 1951–1964, totalling around 11,000 homes in all. Single storey properties, save around 50 or so, these homes were of trademark timber post and beam construction, with soaring flat or gently pitched roofs. Extensively glazed, open floor-plans and often featuring internal courtyards, inside-outside living was built into the very fabric of these homes to maximise light and space. 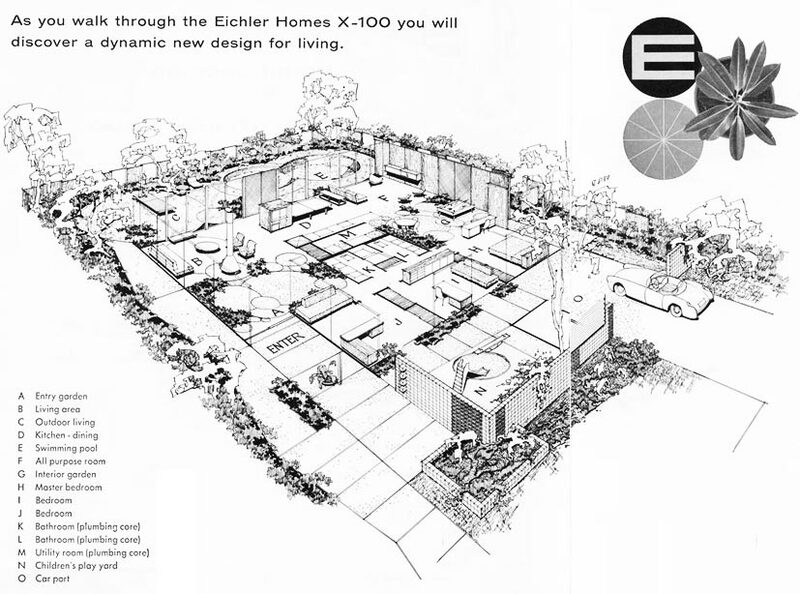 Inspired not only by the work of Frank Lloyd-Wright after renting his Bazett House in 1942, but also his ethos of residential design for ‘everyman’, Eichler believed that his homebuilding could contribute to social betterment and affordability was key to his approach. Bringing good design to the average homeowner – and leading the field in establishing a non-discriminatory policy among post-war builders, his first release of 51 homes in Sunnyvale, California, all sold within two weeks. 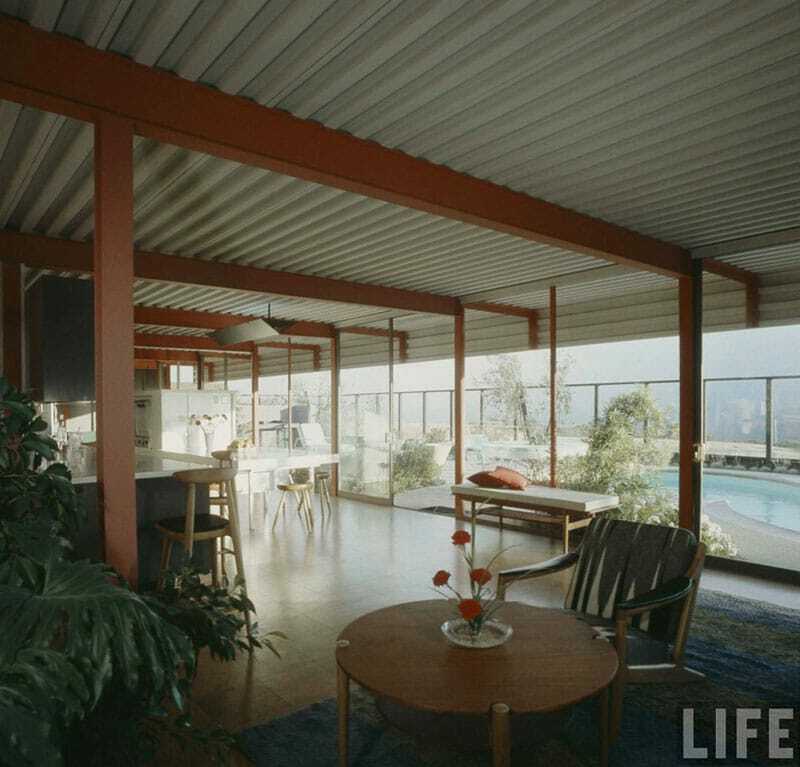 Designed by architects Robert Anshen and William S. Allen, and offering 1,044 square feet for $9,500 including appliances, these were more than mere homes: they were blueprints for the American dream. 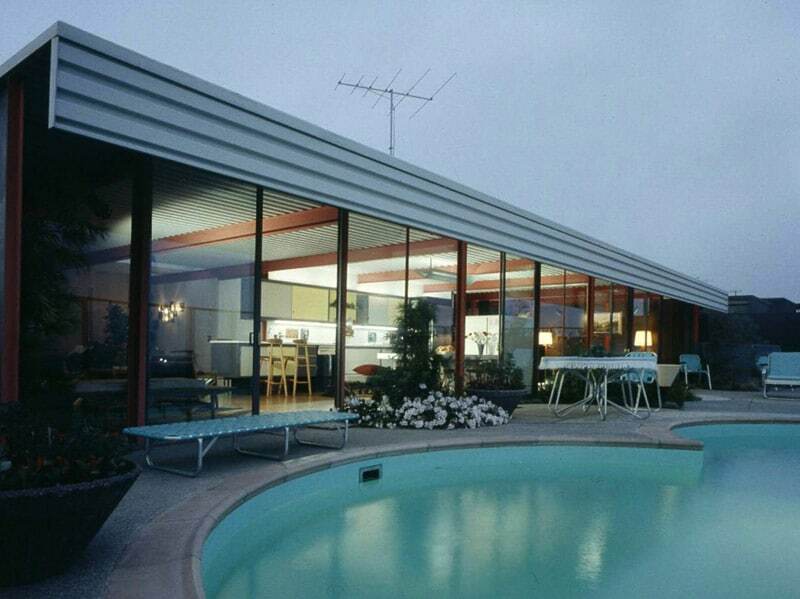 Eichler had a team of expert, progressive architects including A. Quincy Jones and Frederick E. Emmons and in 1955 commissioned this duo to explore steel constructions and create this futuristic house. It wasn’t solely as a show-home: it was to be a prototype for future development – a quest for a new way to build houses that were affordable, in tune with their environment and their inhabitants, offering the latest in conveniences and construction technologies. 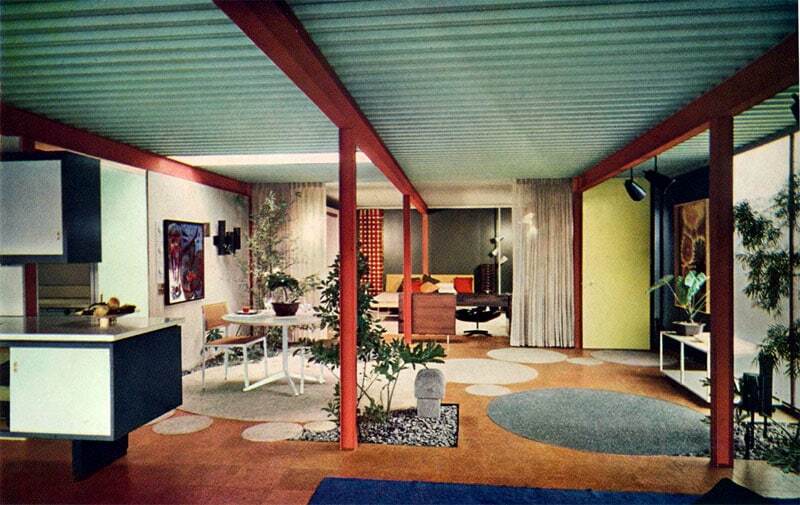 Furthermore, as ‘Arts and Architecture’ pointed out in 1956, Eichler had concerns that the more organic materials might soon be in short supply as they couldn’t be grown fast enough to meet demand. 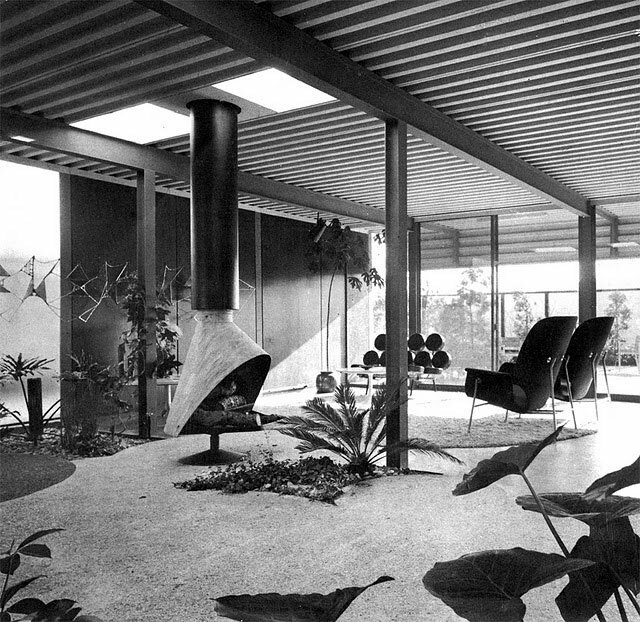 Constructed in 1956 – with the assistance of Pierre Koenig, advocate of steel-frame designs and of Stahl House fame, the result was ‘House X-100’ — a prefabricated 2,226-square foot single storey home; three bedrooms, internal gardens, with experimental materials and features throughout. 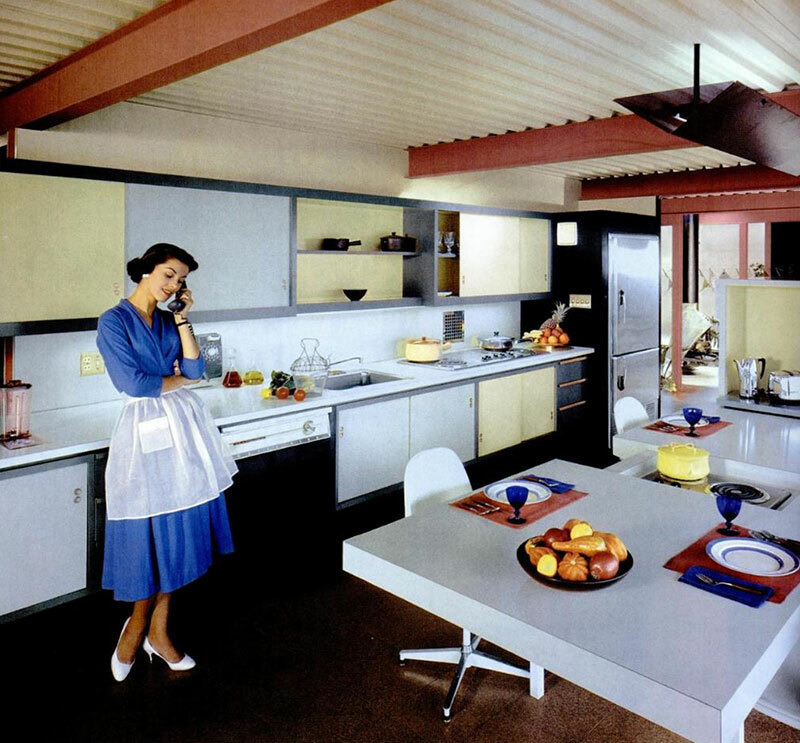 State of the art, no less, as manufacturers who had been clamouring to have their products showcased in an Eichler home had their wishes granted. 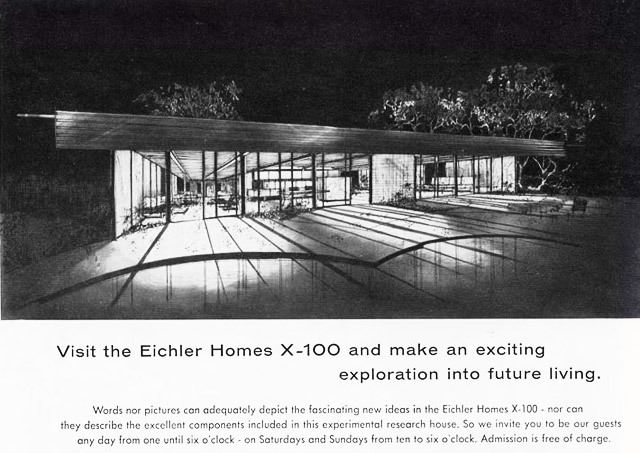 The X-100 was truly a low-maintenance house, fully-featured and of futuristic design throughout. From radiant (underfloor) heating to skylights, intercom, dishwasher, the ‘Super-Hush Pulverator’ waste disposal, reversible kitchen cabinetry (yellow one side, white the other), food-warming burners concealed within the kitchen table, a revolving fireplace, even with a carefully chosen colour scheme of Golden Gate cinnamon and greys to counterbalance the steel – all within a sleek modernist frame, what was conceived (and succeeded) as a marketing tool became a clear vision of the future made real. 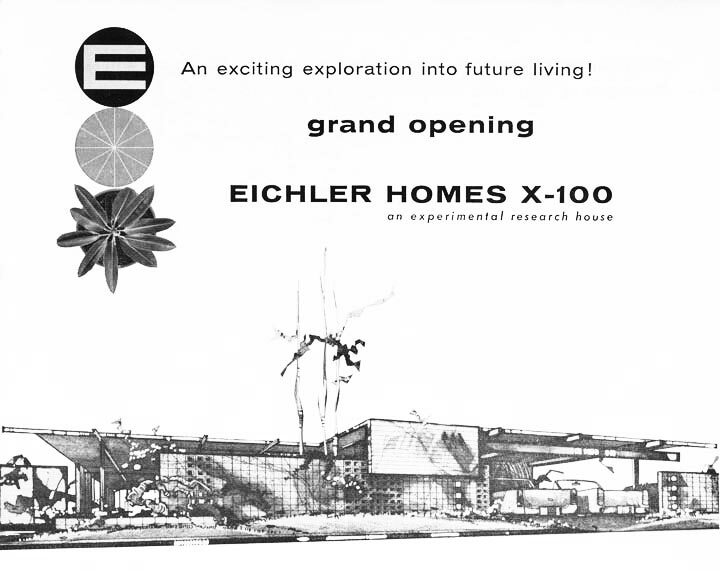 An exciting exploration into future living!… Eichler homes delve into the future with a new living form that serves as a research laboratory for testing new design concepts. 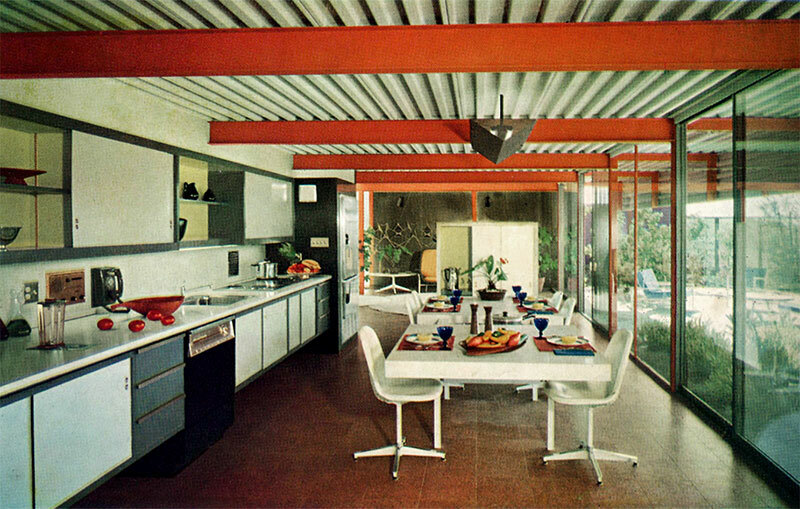 Eichler X-100 Kitchen showing the concealed warming rings within the dining table. The thousands of Californians who crowded into the ‘home of tomorrow’ this week gaped at such innovations as a revolving fireplace, one entire wall of glass, a plastic skylight like a bomber bubble, two indoor gardens, electrically operated sliding doors that replace all windows, and steel-frame construction to eliminate the need for load bearing walls. The experimental home captured imaginations: coined ‘the home of tomorrow’ by major newspapers and magazines, including ‘Life’, and featuring on a Universal-International newsreel shown before features films across the States, the show home attracted over 150,000 visitors. The construction of these steel-framed homes promised great savings in labour costs as they could be erected quickly, however the complexities of steel fabrication and delivery, compounded by the onset of the Korean war rendered steel prohibitively expensive and sadly made it uneconomical for Eichler to continue this line of research. 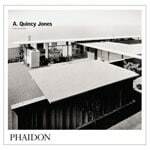 Nevertheless, his legacy of 11,000 homes constitutes one of the most significant and celebrated contributions to the domestic architecture of the midcentury era, with design principles, innovations and ethos seldom seen since, particularly on such a scale. Fundamentally, these were homes of considered design and cost-effective construction which shaped a new way of living – and it’s no surprise they are so highly prized to this day. Here in the UK, Renway’s Edgcumbe Park development of 1958–1970 was strongly influenced by Eichler’s approach, indeed considered futuristic itself employing innovations in design, build and finish hitherto unseen in the UK (see this post about our Renway Type 60A bungalow) – but suffered at the hands of the rising cost of land. Economic factors these days preclude affordable homebuilding to match these properties’ footprints and features: modern day developers rarely able push boundaries in architecture and innovation when budgets are so constrained. What remains is a legacy of midcentury developments whose merit and individualities are being increasingly revered, not least for the quality of their design, but also for their futuristic, experimental feel which successfully captured the spirit of a visionary generation. After the death of long-time owner Anna-Lise Pedersen in 2003, the X-100 was purchased by a preservation-minded group for $775,000 who continued Anna-Lise’s work in restoring the property, to convert it into an exhibition house. It has been nominated for designation to the National Register of Historic Places. Very nice article, and very informative. Dear David, thank you so much for your comment. The conversation you relate between your grandfather and Frank Lloyd-Wright made us grin – what an insight! Thank goodness Joseph stayed committed to his vision and left such an accessible architectural legacy – not just in the properties he built, but also in those they went on to inspire – properties that so many of us can admire, and still have the opportunity to perhaps reside in, too. He struck upon fundamentals in house design that remain as fresh and relevant today as they were all those years ago, and which are arguably un-bettered. 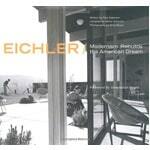 Given budget and a plot of land, we’d build a house to an Eichler design in a heartbeat. So pleased you like the post!